The quarterfinal round of the Bank of the West Classic generated a rough day at the office for 2009 Wimbledon Champion Serena Williams. Although Serena did seem a step or two off of her game, that wasn't her problem. 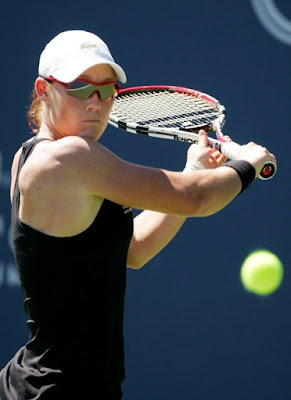 A very focused and powerful Australian who goes by the name of Samantha Stosur was the issue. After losing the first set, Serena managed to take the second from Stosur but never really seemed to have a solid grip on the match. Of Stosur's play Serena said, "she had a lot of lucky shots; she's a good framer, but it's obviously all talent. She's mastered that." "She played well and didn't do anything bad," Serena continued. She went for broke and struck all her balls as hard as she could. She never lets you get into a rhythm. Of all of the WTA Tour players, I personally never saw Stosur with the potential for this level of effectiveness in singles. Stosur has quietly come up the sides and is a serious threat. "It's one of the biggest, if not the biggest win of my career," Stosur said. "We don't always play our best tennis every single day. Maybe she didn't play her best and I played very well." "At the end of the day you have to go out and play well," Stosur said. "I'd like to take it one more step. I'd love to make it to another final."